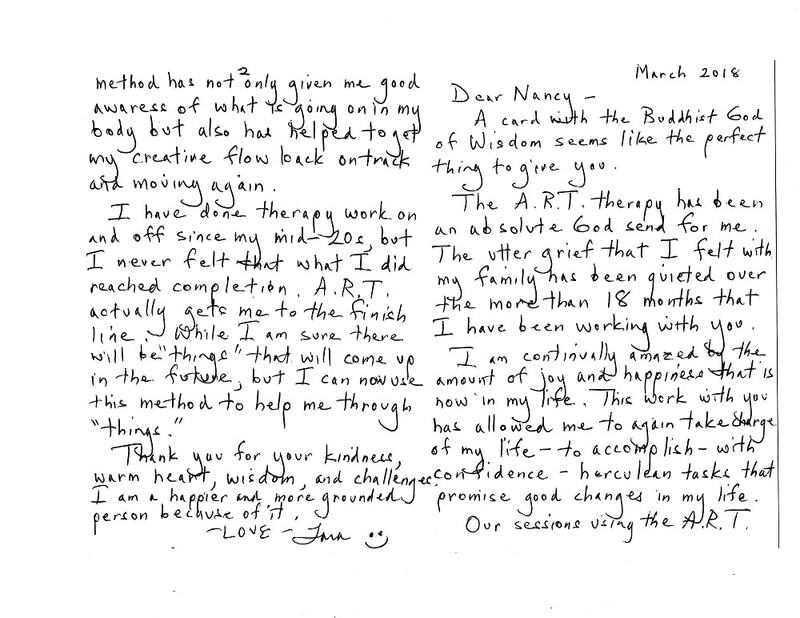 "ART [Accelerated Resolution Therapy] has been an absolute God send for me. … I have done therapy work on and off since my mid-20s but I never felt … completion. … A.R.T. actually got me to the finish line. … Thank you for your kindness, warm heart, wisdom, and challenges. I am a happier and more grounded person because of it." "Nancy's approach is very straightforward, with a great deal of concern and understanding. … she listened to and acknowledged my feelings and concerns with sensitivity, respect, and sympathy." 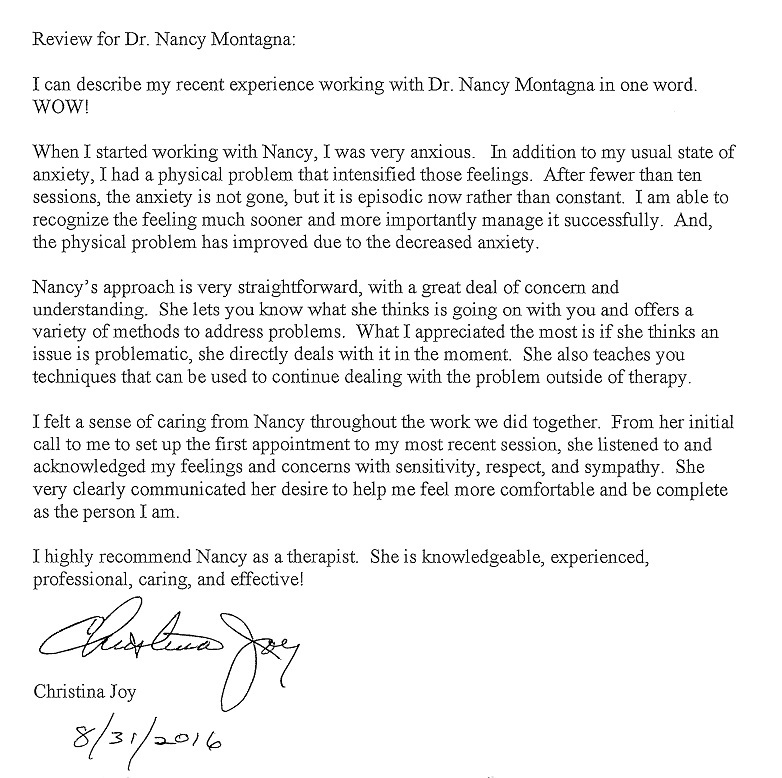 "Dr. Montagna has been my go-to psychologist for more than 3 decades. She has that special blend of professional expertise, kindness, and instilling confidence so that I may make changes in my life that make for a happier and healthier me!" Nancy "knows how to get to the heart of an issue and begin to see it differently and see creative solutions. I can't say enough good things about her and would recommend her highly to anyone." "Nancy has been kind, wise, and empathetic. She has gone the extra mile, for example by learning a new technique that held promise for my healing. I am so grateful for the help she has given me. I have referred friends to her, and they too have benefitted." "Nancy has a beautiful spirit, keen intellect, and depth of feeling and empathy. She enabled me to understand and comprehend much of the world we inhabit, during different periods in life. She provided wisdom, ways of healing, and joy." "Within minutes I knew I had hit the right person for me … she has been spot on with identifying the camoflaged deeper issues …. I have been able consistently to move out of decades of stuck places. … Her insight of "getting it" has not ceased to amaze me."